This resource was built as a project of curiosity. 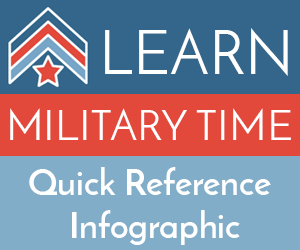 As a civilian, the creators of this site found it interesting that without being involved in the military, emergency response, or other niche job roles, you would never properly learn military time in many educational systems across the world. We have learned an extraordinary amount about the use of military time, its history, and even a few tips and tricks along the way. MilitaryTime.us is a repository of all the things we have learned to be shared with anyone who wants to learn more. If you find information here that is lacking, should be revised, or even have ideas on other information we should add to the site please feel free to let us know by using our contact page.